dude sahara you need to help me when Im styling the bowser wig @_@ Im not sure how I'm going to make it look llike a rats nest but still make it wearble. xD our bowser is a feme bowser, so shes got a wig. This is my first time trying to style a wig and I am trying to turn this into a black star wig. Ah gel is not the way to go. It's meant to work with the oils in your hair, wigs don't have that oil. Use Got2b Freezing Spray and Got2bGlued. They can be found in stores like Rite Aid, Fred Meyer, etc. here this is a link to styling a gokudara wig, its a diffrent character but its good for ideas. the product they use in this vid are VERY good for wig styling. sometimes you have to sacrfice realistic for acuracy. thats the advice I have for now : ) I'm no wig expert but Ive travled the net enough to build up quite the list of tutorials. remember to study your characters hair from all angels! [EDIT] sorry thought those pics were what you were going for not for what you had! O_O @_@ *feels bad now* it's a good start! like i said a lil windblown but wigs are hard to get used to! suger do you know if this is a one time only wig or what? Any type of glue is good for gluing hair to something(like other hair). you really don't need the special stuff. Just thought I'd interject with wig randomness. tofu: glue works well to but its much less mistake friendly. I'm planning on cosplaying Ranka Lee, but I have no idea how to achieve her hairstyle. I'd rather not buy an already-styled one or make clip ons again; it's just far too expensive. Was thinking of using a wig like this. I'm just having trouble with the hairstyle. I love Ranka, I'm sure you will be adorable. The best jobs I've seen on the wigs weird ear things is when people put detachable ponytails where the ears are suppose to be. They fall just right to give that effect. Unfortunately I have no idea on how to make detachable pigtails but I know there are some tutorials somewhere and that they sell a really nice wig for Ranka with them on Ebay somewhere. Hope that helps a bit. I know how to make detachable pigtails - the problem is, I'm not going to spend another 60 dollars (Miku wig, x_x) making those. I've searched on ebay as well, but none fits into my price range. Or if you can find a better one, I would be really happy! Thanks! I really like the first one, but maybe this would be better? 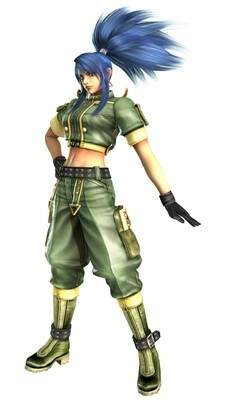 I'm going to be doing this version of Leona from King of Fighters. Its kind of hard to tell what her hair is like in this picture but it looks like a toned down version of her ponytail from the old KoF's http://x63.xanga.com/3a8d847058d30147637910/z109637202.jpg. I know how to do a high ponytail (shorter wig, put it up, cut off the ponytail, stub it, add extentions. But would I just add more extentions to make it fuller or will I need to mostly style it to get it that way. I'm thinking I'm not going to make it that huge though, I think making it a little more realistic will make it look better. I liked the first one, too! 8D Cool, cool. Thx! I want this wig really bad, srsly. I could use it for two or three, possibly more, versions of Lenalee from D.Gray-Man, not to mention I just love having the weight of pigtails on my head. But the ponytails are clip-on, does that mean they're like the kind with alligator clips on the inside that have one long section you can clip onto? Because that would present a problem for one of the versions of Lenalee I want to do with it. Okay, I figured as much. The wig's coming some time this week anyway. Sorry XD I haven't looked at this thread for some time. I would like to say this: NEVER order from cocosilverhk if you want your wig quick, 'cause it never gets here that fast. I ordered my wig almost 4 weeks ago and it still hasn't came yet. I did, and they sent me the tracking number so I could see where the item is right now, which proves that they sent it out. I'm going to be doing Roxas, and what kind of wig would be best for a base? I know I'll need it to be full and long enough to do all his spikes, but how long should it be? Any ideas? I was thinking shoulder-length. And what do you think is the best color? I know not to go with the bright yellow, but I've seen pictures of him with blondy hair, and others with him with brownish hair...I guess it'll come down to what I want and find, but it'd be nice to have a second opinion. Please for the love of god do not get a bright yellow wig x.x Blond is ok but not bright highlighter yellow. You could look for some wigs then post the links here and we can tell you which one we think is the best color. But in Sayda's avatar you can see Anna with the Roxas wig on. I think that wig is perfect so shoot for a color similar to that one. I find the best cosplays come from a more realistic color of hair for your wigs. Especially with blonde, naruto for example many people go bright highlighter yellow, however i think it looks better with just a more natrual looking blonde. I believe the same would go for roxas, hes style is a bit more realistic than some anime characters. Hence why his hair color should be more down to earth, even if its spiked upwards. Okay. That's what I thought. I've been looking around and found a couple that would work. So, once I get more money, I'll get one of those. Also, just a quick question: where would be a good place to get a foam wig head? Sally's beauty supplies has them, I also found one at Value Village once. Right...Aren't they 5$ or so...?